Micro LED Display Market size is set to exceed USD 14 billion by 2024; according to a new research report by Global Market Insights, Inc. The industry expects shipments of approximately 1 million units by the end of 2018. 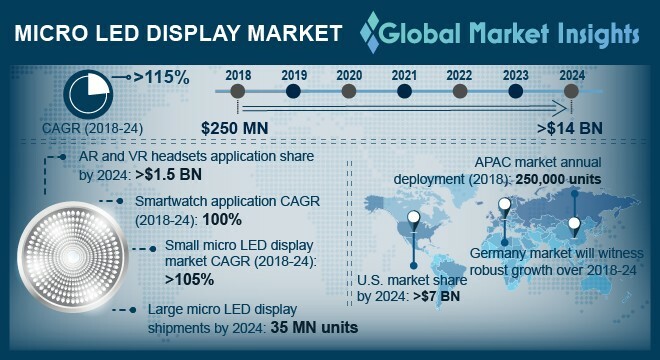 Increasing demand for high-performance display solutions in advanced applications, such as wearable devices and automotive, will drive the micro LED display market growth. These energy-efficient devices potentially reduce the size of the wearable devices, thus encouraging the device manufacturers to adopt these components. Furthermore, the technology allows modifications, such as transparency and flexibility, in display systems, increasing the market share.